Image caption Middlesbrough Council has warned the health secretary of "unacceptable risks"
Cuts to respite care for families of severely disabled children have been referred to the Department of Health. NHS bosses on Teesside plan to introduce an assessment of parents' needs, which they admit might reduce provision. 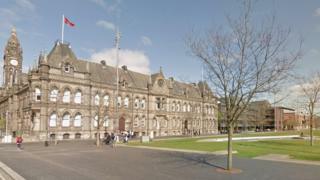 Middlesbrough Council has told Health Secretary Matt Hancock the proposal would lead to "unacceptable safeguarding risks". His department has been contacted for comment. The council said the "proposed changes to the assessment and allocations process have not been defined with sufficient clarity and completeness". They were "not financially justifiable on any rational basis", it said. Parents of severely disabled children in Middlesbrough and Redcar and Cleveland are currently provided with 33 nights of respite care a year. South Tees Clinical Commissioning Group said it could not guarantee the same level of services would continue after the proposed changes, the Local Democracy Reporting Service said. Middlesbrough Council's health scrutiny committee chairman Eddie Dryden said the current arrangements would only remain in place until the end of the year. Provision was needed "beyond December" as families booked months in advance, he said.